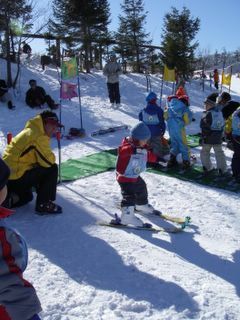 This was my younger son's skiing debut!! We went a ski resort in Tochigion on Sunday. 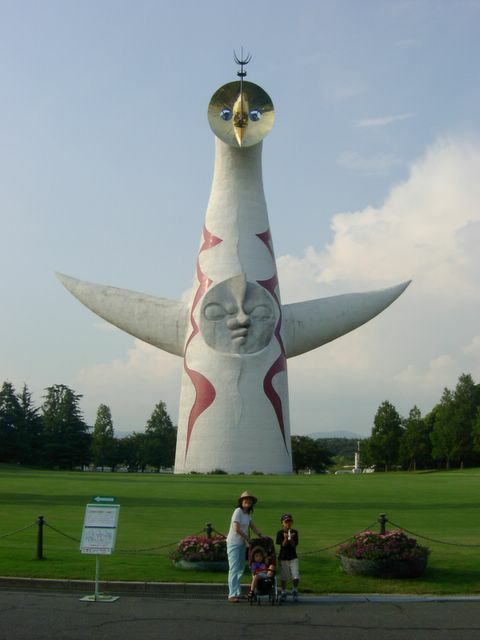 It is about four hours from Tokyo by car. 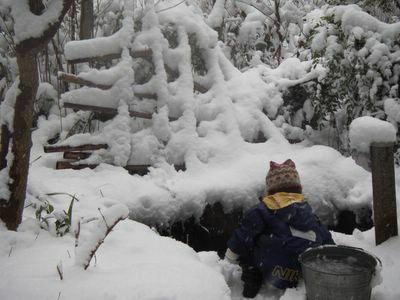 It was the first time in this winter for my family. Actually, my husband was too busy to go skiing. 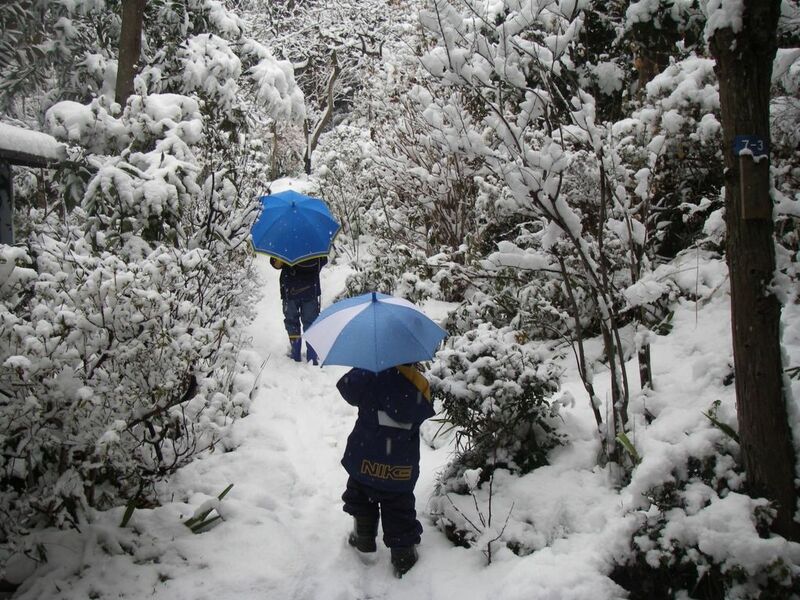 We have been hoping to go skiing this winter. At last we could go skying. My ounger son was first time to get on his new skis which was bought (in) this winter. 1. It was my younger son's first time on his new skis which was bought this winter. 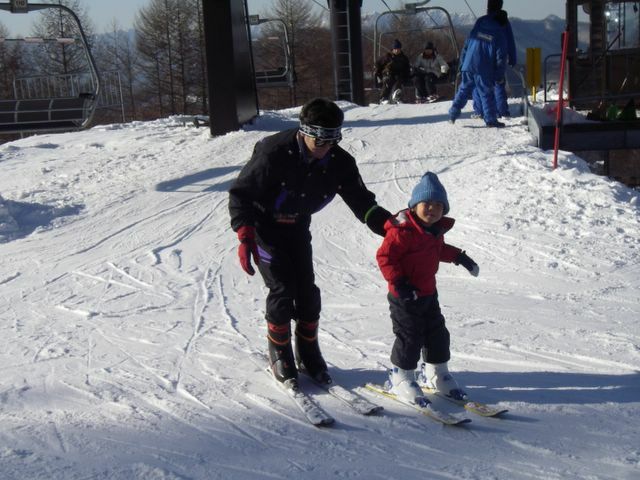 2.My younger son got on his skis for the first time. 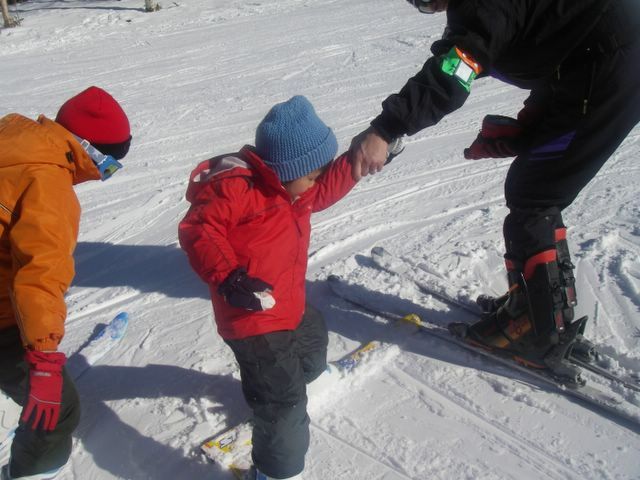 3.It was my younger son's first chance to get on his new skis. Also it was his first time takin ski aking school. It seemed that he didn't like the ski school. 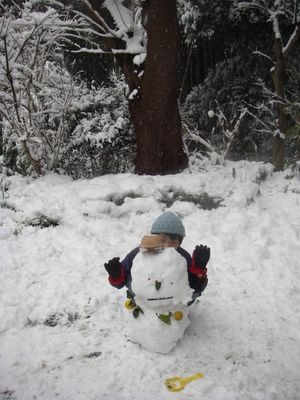 But in the afternoon he ran with his father on a snow slope. He was so pleased. 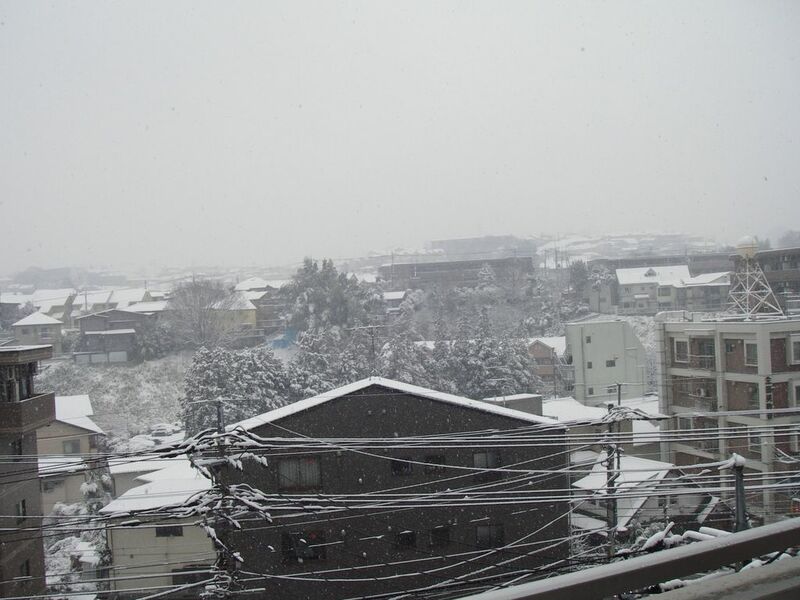 It was the first snowy day (of) this winter. 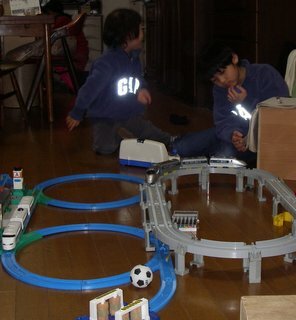 We went to my mother's house which is near(close to) our apartment. We made a snowman whose eyes were nanten nuts, nose was a laurel's leaf and hands were a kind of Japanese lemon. It is snowing from midnight in Tokyo. 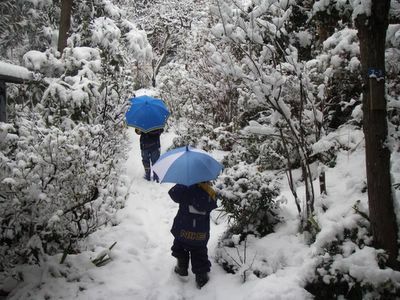 And it is a very cold day. 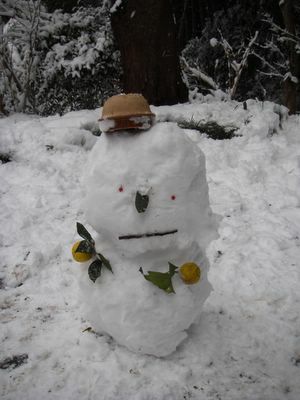 This Japanese Winter they said it would be warm. But it is very cord. Side of the Sea of Japan area has been much snow. It is terrible. It is a Todaiji's column. Todaiji is a famous temple all over the world. 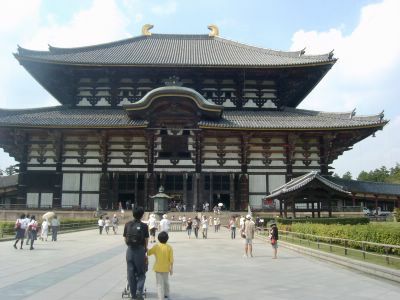 If you come to Japan, you should visit Todaiji in Nara city. 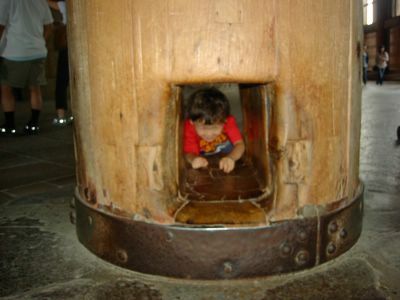 When I was a child, I used to go through this tunnel. My mother said it was luky tunnel. Dreams come true. My mother said someone who was a little fat couldn't go through it. And he had rested in this tunnel for three days until he was hungry. ( I don't know if this story is true). 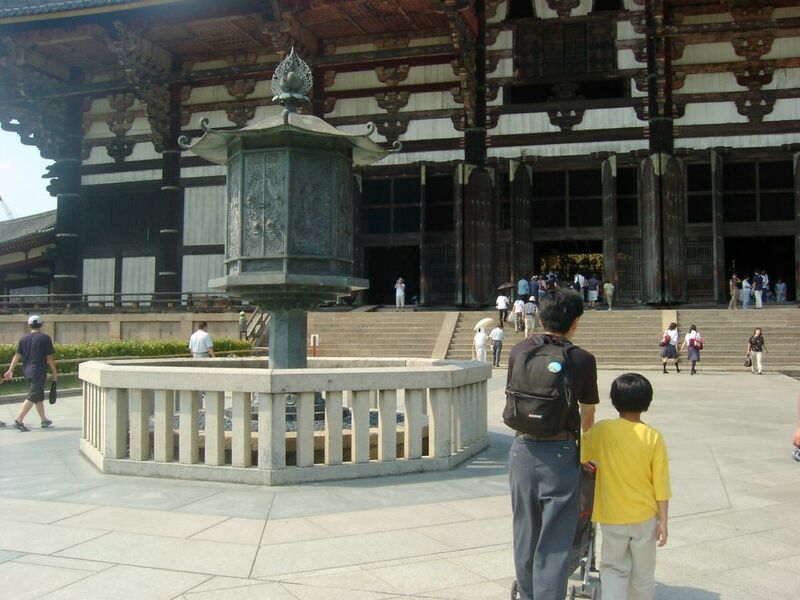 Todaiji's inside is dark, don't miss it!! 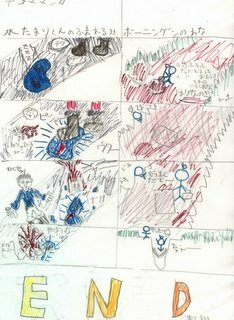 My older son drew this cartoon which has two storys. You read down it lengthways , what is japanese way. speaker, You don't understand it. He asked me his cartoon to post his mother's blog. He likes to draw something. I hope he trys to make somting in his huture. By the way do you know "The Phantom" ? I found it in Australia. My big headache was kiling me this morning. Sometimes I have a headache. I think my headache is a kind of migran. My head has beenaching for three days. My doctor said I should quite my job which use computers. And I have too much stress. I think if I didn't have a headache, I would do more things. When I was a pregnant, I hoped I changed my consitution. Acutually when I was a pregnant, I had less headache. But after my son was born, it came back to me. Two years ago I went to Perth in Australia with my oldest son. We stayed for 3 weeks in Perth. It was fantastic. He had wanted LEGO since coming to Perth. Then I bought one kind of LEGO in a department store called Myer. After we came back to the hotel, he started to build it. He was so delighted. When he almost finished, he said "A parts is not in this box. I didn't it". And he asked me "Please ask to change it". The next day we went Myer, and he asked me again. Actually I didn't want to say anything. Fortunately Myer was having a christmas sale that day. I got it cheaper than the day befor. It made my son and me happy. Myer is a wonderful department store. Why do I call me "Lucy"? My name is Lucy. You know I am Japanese. Of course it is a nickname. This nickname has a long story. 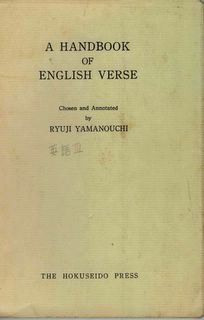 When I was a freshman in university, I had standard English which were old English poems. Those lessons were so boring. Because the professor was very old, sometime he went to the bathroom while he went into teaching for students, and English poems were difficult to understand. When we started the first class, the professor taught us a poem called "Lucy". The poet's name was William Wordworth(1770-1850). means shining. Your name is same "Lucy in English ". " but from that lesson we made friends with each other. That's why my classmates called me "Lucy". By the way does "Lucy" mean "shining"? I asked native English speaker about it. But they said we didn't know. If you know about meaning of Lucy, please tell me. Do people always separate their garbage? No, unless there are garbageis near by, they don't separate burned or nonburned. Do people always share bath water? Yes, unless peple are same family, they always share bath water . Because Japanese style bath room seprate bath tub and washing body space. Do peopole use public transport? Yes, unless it dosen't have a few line like local country, we use public transport. Do office workers always recycle paper? Yes, unless there isn't a recycle box, they throw away in the gabage. And it depends on their how much thier time. Do shops avoid using too much packaging? Yes, unless custmers don't need it, shops avoid using too much packaging. Do people care about the environment ? Yes, unless people have children, they care the enviroment. For example saving water, as less as use detergent. They must save nature for posterity. When we bought someting, we use a plastic bag, which throw away after shopping. We sholdn't get a plastic bag as much as possible. 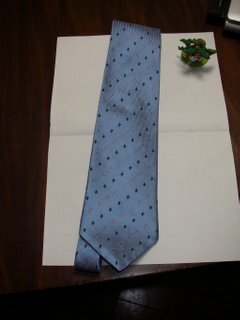 Minister Koike presents said "Let's use 'Huroshiki' " ,which is like a big handkerchief. We used it long years ago in Japan. That is a Japanes culture. I think I try it. I has a job. My older son goes a junior shcool. He goes a after private school, after finishing his junior school which fee is a little expensive. A pubblic after school is suppose to finish pm6:00. And teachers are too few to take care of chaildren. I am a office worker. I can't cheat a income tax and stuuf. But I wrote like it above. Pubblic after schools aren't answer our needs. Recntry Liberal Democratic party sweeped in this election. And some young people who don't have nopoliticsexperience nolifeexperience were elected. I am afraid they understand our working mother needs. New years holidays was over. From today it started my life, which is busy again. 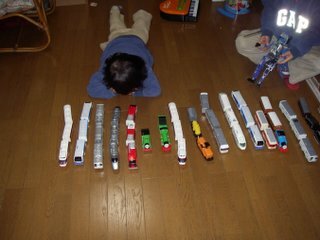 I have to go my office, after I carried my younger son to his pre-school. When I get off his pre-shcool he usually can't say "Good bye mam" quickly. And I am later than I thought everymornig. I wish to need someone to help me. 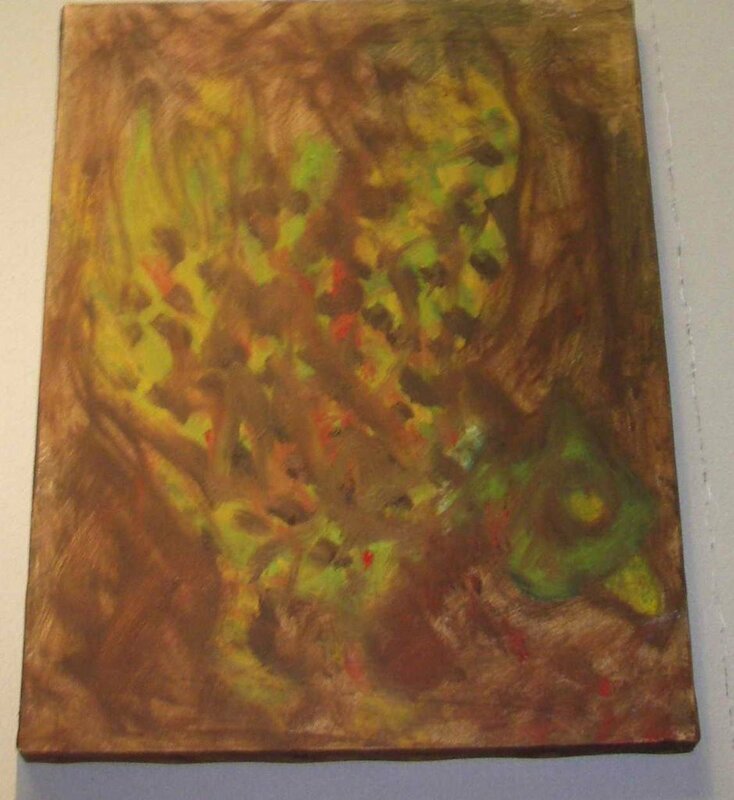 This is a oil paiting which was drawn by my older son. 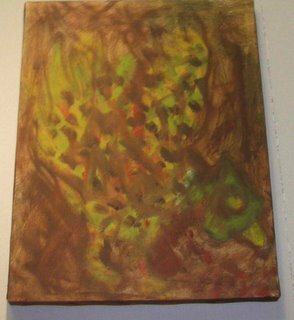 When I watched it at an exhibition, I thought it was a greate painting. After this exhibition, he brought it to our home. And I looked at it very closely. d it and I took it. I said to my son. "Oh this is pretty painting." But I thought this was little defferent. He said "You're holding it upside down,"
By the way do you know what he drew? This is a kind of bird called a pheasant. This year is the year's of the dog in Chinese astrology. We wrote new year's cards. When I was young, I didn't know I could write a new year card that was happy. Recently it is difficult to think of "Happy new year". There are a lot of troubles in the world, and around us. Do you understand my feeling?